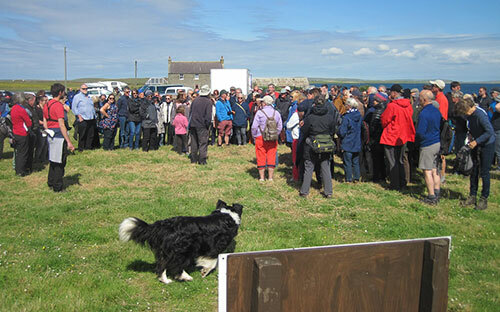 The crowds – over 200 – gather for the first site tour of the season. The floors of Structure Eight are revived from their winter slumber. It’s quite something to be a digger at the Ness. Every year site director Nick turns down scores of hopeful applicants, and for that reason those who do get here have a duty to work to high professional standards, right down to the little matter of writing legibly on finds bags. If they don’t, they have Anne and Martha to deal with. Anne is the finds supervisor and Martha is the “rock lady” (yes, she does like Eric Clapton but the name comes from her ongoing PhD on the Ness rock). The day began with Anne and Martha giving short, but firm, talks on how to deal properly with finds, be they flint, stone, pot or whatever. Nick followed with the very necessary reminder to diggers not to rub at pottery with their thumbs. We have all seen it, we may even all have done it, but it removes vital evidence such as decoration or carbonised material which can be used for dating. Released from class, the teams embarked once more on cleaning trench surfaces ready for more intense activities tomorrow. The most eagerly anticipated event will be the arrival of Vivian Flett, with his JCB. Vivian, better known by his nickname (which we cannot reveal) is an artist of the highest degree with his massive machine. We fully believe he could comb our hair with the leading edge of his bucket without damaging us in the slightest. Anyway, Vivian will be extending the mysterious Trench T, thereby opening up the possibility of understanding more about this unique and puzzling structure. 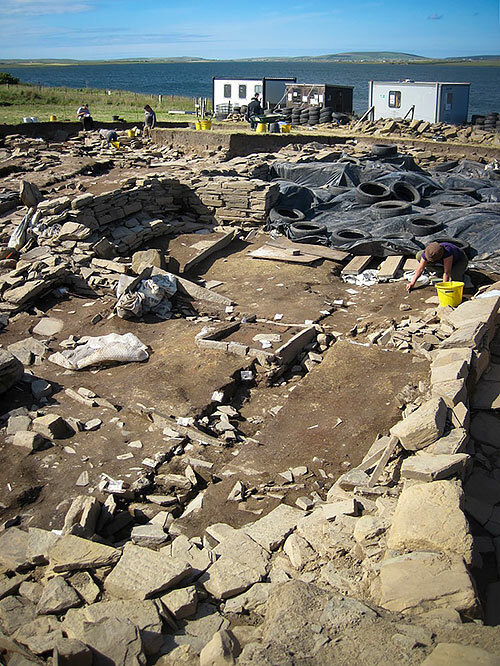 Back at the main site it is a delight to welcome back Catriona, supervisor of Structure Eight and one of the busiest archaeologists in Britain. Catriona exists in a whirlwind of activity, regularly producing the highest quality books and academic papers on vital areas of study. Unfortunately, this means that she can’t be with us at the Ness for too long this year, but she and Nick are having deep discussions on the way forward for Structure Eight. The first tour of the season is shepherded by site dog, Bryn. We were also visited today by Dr Stephan Veil of the Landesmuseum in Hanover, Germany. This followed a visit, and tour, of the Ness yesterday for a number of distinguished German archaeologists, who were here to see our Archaeology Institute Professor, Jane Downes. As our connections with European colleagues are subject to change at a national level, it is ever more important for us to meet and talk with European academics and to consider ways in which co-operation and joint ventures can be maintained and enhanced. Jim’s cradle support for the central standing stone. One of the heartening things about working at the Ness, and regularly encountering all sorts of difficulties and practical problems, is the frequent presence of Jim, the man who can build or repair anything under the sun. 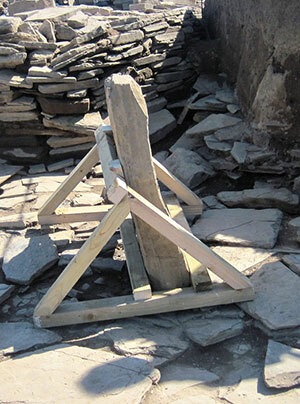 Today, he has been building a wooden cradle to support the standing stone in the central area of the main trench. This has been showing signs of giddiness for some time and now is clearly in need of help. We will tell you how it gets on. Lastly, and by no means least, one of our Masters’ students, Simon Gray, has been filming a video blog which can be found on this website. Simon will be contributing regularly and we look forward to his efforts to portray us all in as good a light as possible.